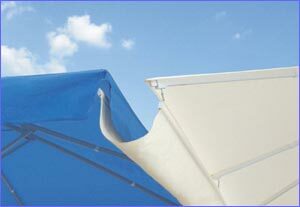 Rain gutters provide uninterrupted sun and rain protection between umbrellas. Gutters can connect several umbrellas into one unit, providing large continuous area that is protected from the elements. Gutters can also connect an umbrella to a building. 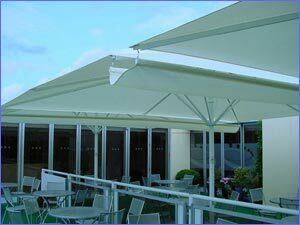 Our conically manufactured gutters are attached to the umbrellas at a slight decline to assure good drainage. Water stop at the higher end of the gutter gives additional protection in heavy downpour. 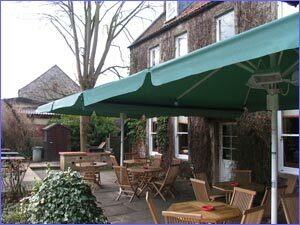 Gutters can be attached to umbrellas with or without the umbrellas having valances. 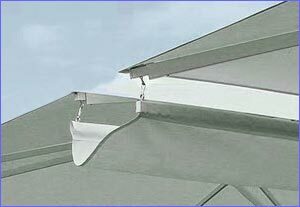 Valances, folding into the gutters, give a little more protection from the rain when wind is also present. 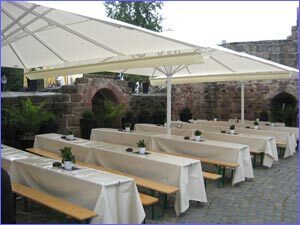 When the umbrellas don't have valances, the gutters are suspended further in from the edge of the canopy to reduce the gap thru which the wind can blow in some rain. 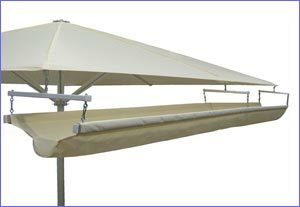 Even single umbrellas can be equipped with self supporting gutters to allow rain water to drain away in a desirable direction.